I came across this scenario where I cannot browse my SharePoint web application; it asks for my credentials 3 times but doesn't render the site and also doesn't show any errors. Basically I had 3 web applications in the same server; setup using host names to run on port 80. The host file (C:\Windows\System32\drivers\etc\hosts) is modified to map my web application URLs to the local loopback address. 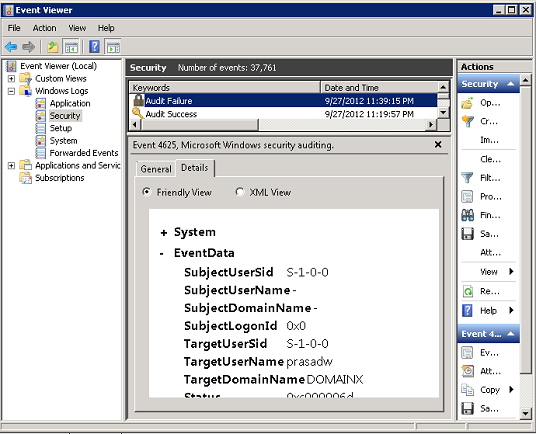 When I check the Event Viewer of the SharePoint server, I found set of Audit Failure logs which seems to be relevant to this scenario. Then I found that when we use the fully qualified domain name (FQDN) or a custom host header to browse a local Web site that is hosted on a computer that is running Microsoft Internet Information Services (IIS) 5.1 or a later version, we may receive this error. It says that this issue occurs when the Web site uses Integrated Authentication and has a name that is mapped to the local loopback address. Also if we browse the Web site from a client computer, we will receive this error message.